BEIJING— Doing business in China, with its hundreds of millions of consumers, has long been seen by many companies as an enormous opportunity, but it has never been easy for foreign firms. And it is not getting easier, even as Chinese grow wealthier. The heads of two of China’s biggest foreign business organizations say that in addition to restrictions that bar international companies from a wide range of sectors, there is also concern that foreign firms are being targeted as the government carries out an aggressive anti-monopoly campaign. China’s anti-monopoly regime has already handed out some big fines against foreign companies. 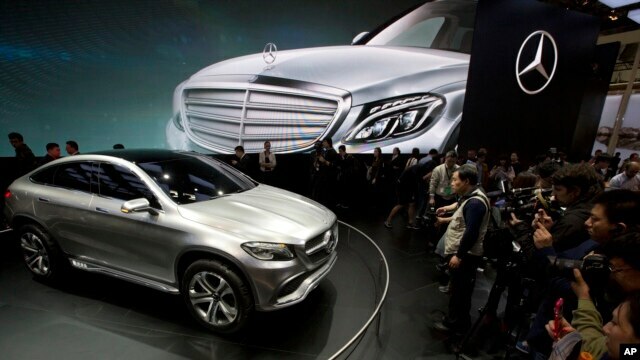 Luxury car maker Mercedes Benz received a $55 million fine for alleged price fixing. San Diego-based mobile computer chip maker Qualcomm has agreed to pay a massive $975 million penalty after it was accused of unfair pricing of technology licenses. China's anti-monopoly law was passed in 2007, but it was only until a year after Xi Jinping rose to power in 2012 that the country began stepping up efforts to implement the legislation. For many government agencies the regulations were completely new, said James Zimmerman, chairman of the American Chamber of Commerce in China or AmCham China. “There is a learning curve that the Chinese government is going through,” he said. And AmCham members feel like they are getting caught up in that process. Zimmerman and Joerg Wuttke, president of the European Chamber of Commerce in China, spoke with reporters about the challenges at a recent briefing organized by the Foreign Correspondents Club in China. China denies that foreign businesses are being unfairly targeted. Its National Development and Reform Commission has said that 10 percent of the companies targeted are foreign firms. Chinese companies that came under anti-trust probes include state-owned giants China Telecom and China Unicom. Two distillers Kweichow Moutai and Wuliangye were each fined more than $33 million last year for monopolistic practices. In a recently released survey on China’s business climate, AmCham China found that nearly half of its members who responded felt less welcome and the pressure that members are under from oversight is a big source of concern, Zimmerman said. China’s leaders have described the “New Normal” economic concept as one that focuses on higher quality economic growth, but lower rates of expansion. That follows years of double digit growth, fueled in part by massive government spending, in particular on infrastructure. As part of the “New Normal” plan, officials have said they are targeting inefficient monopolies and corrupt business practices. Zimmerman noted, however, that while the United States has 125 years of experience with its own anti-trust law, China only has eight years. That has led to uncertainty over the rules and enforcement. The heads of the two business associations say their members are also very concerned about China’s continuing denial of market access to foreign companies in a wide range of sectors. Currently, all foreign businesses must receive government approval to operate in China. But in special free trade zones, which are cropping up around the country, a different approach is used. In Shanghai’s Free Trade Zone (FTZ) for example, investment is allowed in any sector except for those included on what is called a negative list. But American and European business groups say those zones have done little to attract businesses, because a wide range of competitive business sectors are still excluded from the country. The legal services market is shut and companies in the service industry are not allowed to open new branches in China. Companies in the health and education sectors also have been disallowed from entry. European Chamber of Commerce President Wuttke pointed out that although the Industrial Commercial Bank of China opened three new branches in Europe in recent weeks, China is still reluctant to allow European banks in the country.